Less than two months after embarking on her maiden voyage from Vienna, Crystal River Cruises’ Crystal Mozart has launched live view cameras – a river industry first – from three vantage points aboard the luxurious vessel. 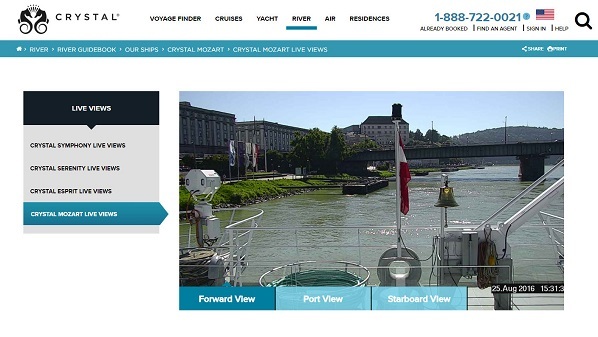 Travellers seeking a glimpse of the enchanting medieval villages, expansive landscapes and stunning cities on Crystal Mozart’s route along the Danube, can now select the “Live Views” option on Crystal’s newly redesigned homepage, and enjoy real time views of the ship’s position. “The live views are truly a benefit for our guests and future guests at home, as they can be instantly transported to the picturesque destinations that Crystal Mozart visits,” said Crystal president, Edie Rodriguez. “It is also an extremely useful planning tool for those unfamiliar with some of the ports. While the live views feed have long been featured on the Crystal website for the company’s ocean ships, Crystal Symphony and Crystal Serenity, as well as Crystal Yacht Cruises’ Crystal Esprit, their positioning on Crystal Mozart marks the first ever occasion such digital perks have been featured on a river cruise ship, further cementing Crystal Mozart’s status as the most technologically advanced vessel on Europe’s rivers. Each suite aboard the completely reimagined river yacht offers Apple iPad devices that serve as Digital Directories for virtually all of guests’ on-board needs, from dry cleaning and butler service to room service and dining reservations, as well as concierge and Crystal Adventures inquiries and more. Suites also boast 40-inch flat-screen HD televisions, along with backlit bathroom mirrors with integrated televisions. Throughout the ship, digital signage puts available services and port information at guests’ fingertips, including weather forecasts for the day, available spa appointments and dining reservations and profiles of Crystal crew members. The luxury river yacht sails two distinct itineraries of ten and 11 nights along the Danube, plus a special ten to 13 night Christmas and New Year’s Eve voyage.